April 2017 - showing his proud attitude! What a knockout! Adonnis is nothing short of amazing with perfect conformation and beautiful fiber. He passes these traits along to his offspring and put show winners in the ring. Adonnis has numerous blue ribbons and Color Champion and Reserve Color Champion banners. Crescent Moon's Starbright is a beautiful medium rose grey Rayo Del Sol daughter. 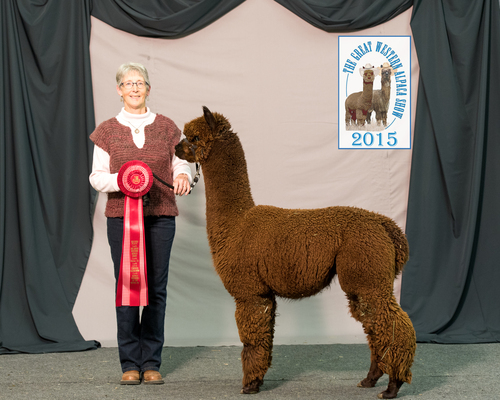 She herself is a two time blue ribbon winner and Reserve Color Champion. 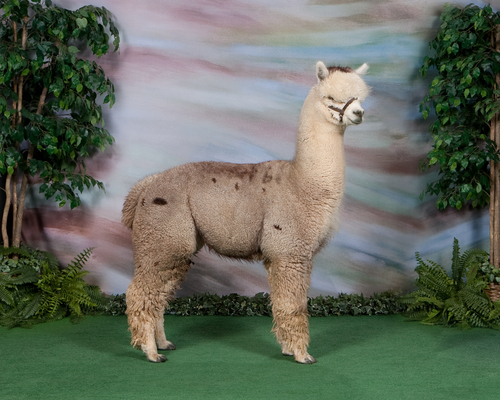 Starbright is throwing awesome show winning crias with absolutely incredible fiber. *Sadly Starbright passed away early 2015. 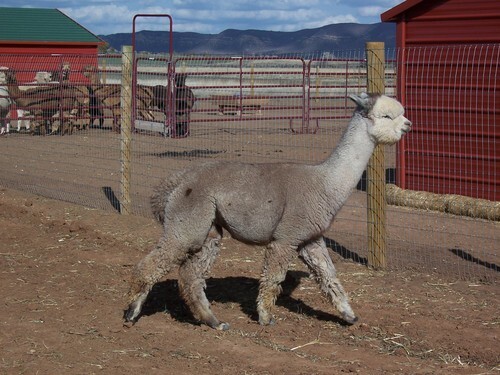 Adonnis' Altitude NS is a stunning Light Rose Grey ATV Adonnis son (ATV Adonnis took 2012 Futurity Reserve Herdsire for dark colored offspring- now deceased) AND a Rayo Del Sol grandson. Altitude stands out in a crowd and draws attention due to his awesome proud "look at me" stature but it is his fiber and genetics that bring him to the top. 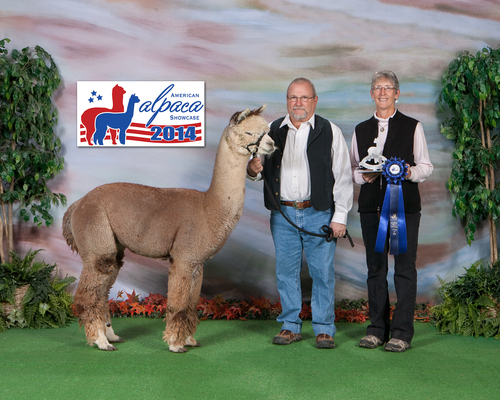 As a 7 time Blue ribbon winner (6 in halter and one in fleece show) and 2X Color Champion you know this awesome male has what it takes to rise above the rest. To say Altitude is the "Total Package" (as described by 2 AOBA judges) is an understatement. Conformation is perfect and fiber is OUTSTANDING! 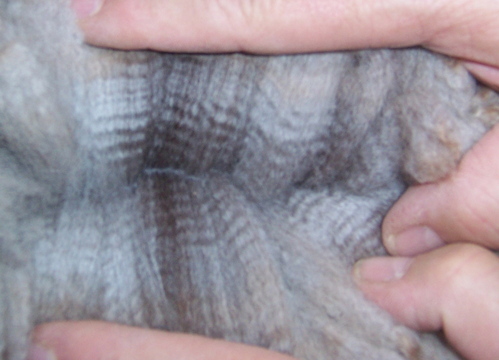 Fiber is dense, dense, dense, fine and consistent crimp from head to tail. His fiber is actually getting better as he gets older! Altitude WILL add to your breeding program and follow in his sire's footsteps of putting champion winners in the show ring and bringing ultimate fiber characteristics to offspring. Altitude's offspring are showing great presence in the showring. *Altitude's offspring Graycee, GreyHawk and Serendipity rose to the task and pulled a 4th place ribbon in the very competitive GWAS 2013 Get of Sire. Comment was: "All holding fine, consistent fleece across the board". Take a look at his offspring! Female medium rose grey Graycee Spirit (SOLD) and male medium rose grey Altitude's GreyHawk. They will WOW you! Of course, do not overlook beautiful Serendipity (owned by another ranch). Altitude continues to throw very nice offspring, no matter what the color! 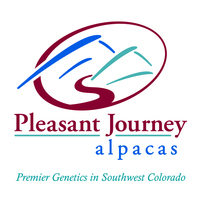 HIs 2012 son PJA Altitude's GreyHawk has recently taken home 1st & CC at 2014 Nat'l Western Stock Show, 2nd at 2014 SWRAS, 1st at 2014 TxOLAN and 1st at 2014 MOPACA, 1st place and RC at American Alpaca Showcase & 2nd place FallFest (class of 8) 2014. 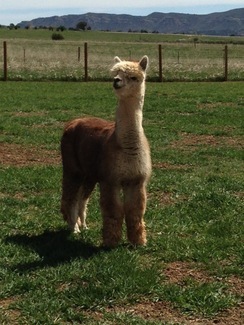 Another of his sons pulled a first place FallFest 2014 as a dk brown yearling! Update- GreyHawk won another 1st place and RC at TxOLAN 2015! Reserve a breeding! 1/2 down Balance due when breeding is completed. WE NOW ACCEPT CREDIT CARD PAYMENTS FOR BREEDINGS! !